**Just a note - this is a renegade event - I tried feverishly to get the proper permission from the school and could not get a returned call or e-mail. I ride here all the time and have never had a problem, even with cops sitting in the parking lot, so all I ask is be respectful to the property-I'll bring trash cans and please don't bring alcohol or other "items". There are apartments across the street, so blasting music might not be cool if too loud. The lot is plenty big & smooth with a very minimal pitch that's just enough to keep you rolling without picking up too much speed if you're down with long rolling passes. Think Ivan and i are going to this jam. Keeping an eye on the weather-there's about a 65% chance of rain in the morning (6-7am) and then diminishing to about 40% throughout the afternoon. Should be cloudy and 75-80. Attached pic is almost all of the spot. Hope the weather doesn't keep too many people away-thinkin' positive for a good turnout!! So the most recent weather report for Saturday has a 65% chance of rain till about 2 pm, then it drops to about 35%. I'll try my best to keep everyone in the loop who's traveling as to what the weather is doing out here. Sunday forecast has changed and is only showing a 30% chance of rain all day, so if Saturday washes out, we can shoot for Sunday. Im hopin it doesnt rain. So, things aren't looking good. All the various weather reports are showing close to the same info - heavy rain from early am hours until about noon/1pm. Chance of rain is anywhere from 70-90% with the high chances of rain ending around 4. With it being cloudy and in the low 70's the likelyhood of the ground drying out doesn't seem very good. Sunday isn't looking as dismal, but not much better - 60% chance of rain and scattered thunderstorms until late afternoon. I'll probably be up at the spot throughout the day to see what the situation is (I only live about 4 mi away) so if your local and feel like venturing out, there might be some people riding, but if you're traveling, I'd probably say save your gas & time. In order to give everyone time to plan, we'll try to do this again on Aug. 30th. So it's not happening today kchez? Looks like some guys on FB are still going. It's still lightly raining here, but 4 mi away at my house, it isnt. I think the NYC will hold off for today. Keep us updated if you guys reschedule it. Never would have guessed in a million years that this would have went down given the weather forecast and what was happening saturday morning. Steady rain from 6 am on, got to the spot and it was raining, lot was soaked. People started showing up anyway. Will and co from Bethlehem, JSteady, Brian from Philly, Gary from TR. Will & his boys didn't give a f%#k and rode in the rain tearing sh*t up on a wet parking lot. Then the rain quit; backpack blowers were broken out. Puddles were eradicated. Jsteady broke out the sound system & the wind worked it's magic and the the lot started drying up. More riders rolled in- Chad from Remorse BMX, Jason Kale and crew from Lancaster, Evan from South Jersey, NJ stalwart Budz. This was going down. The rain stayed away for pretty much all day except for a few sprinkles later on; the 5-0 rolled in while everybody was riding, took a look and left. 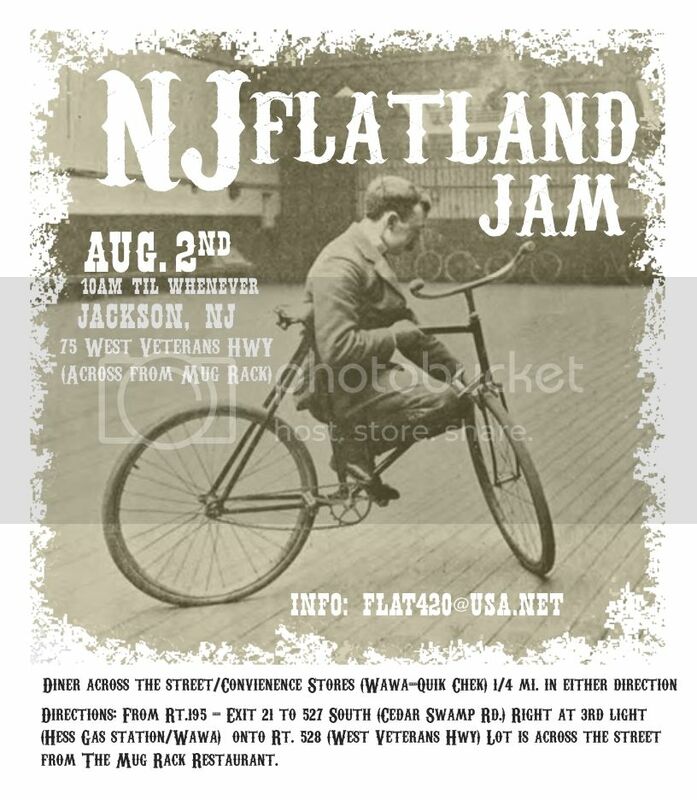 Everyone rode and had a great time, overcoming the weatherman's odds; persevering in the true flatland spirit!! Thanks much for everyone who came out and enjoyed the lot. El mucho thanks to Budz for helping get the word out. I felt bad for painting such a dismal picture on the conditions, but I would have really hated for people to come a long way just to get rained out, which I really thought was gonna be the case. Would love to do another at the same spot at the end of the month. Didn't realize that it was labor day weekend when I threw out the 30th-a lot of people were saying Sunday would be better with Monday being a holiday-what's the consensus? Thanks again to everyone! !